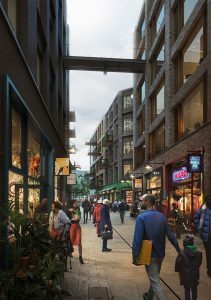 British Land has entered into a Master Development Agreement with Southwark Council and submitted an outline planning application for the Canada Water Masterplan, one of London’s most significant development projects which will create a new urban centre for the capital. Alongside the overall Masterplan the planning submission also includes a detailed planning application for the project’s first three buildings, which include workspace, homes (of which 35% will be affordable) and a new leisure centre. These three buildings are part of a major first phase of the development covering a total of 168,000m2 of mixed-use space with construction due to begin in spring 2019. Cllr Peter John, Leader of Southwark Council, said: “It is fantastic to see this project moving forward. British Land has done great work to consult and engage with local people and the resulting Masterplan will deliver what local people want to see, including a guaranteed 35% affordable housing split 70% social rent and 30% shared ownership in the first phase, new retail spaces and job opportunities, education and health facilities and a brand new leisure centre. On completion, the Masterplan will be home to approximately 20,000 jobs with thousands of people working on site during construction, including apprentices and trainees. A decision on the planning application is expected by the end of the year.